Do you suffer from “stage fright” when you fish? 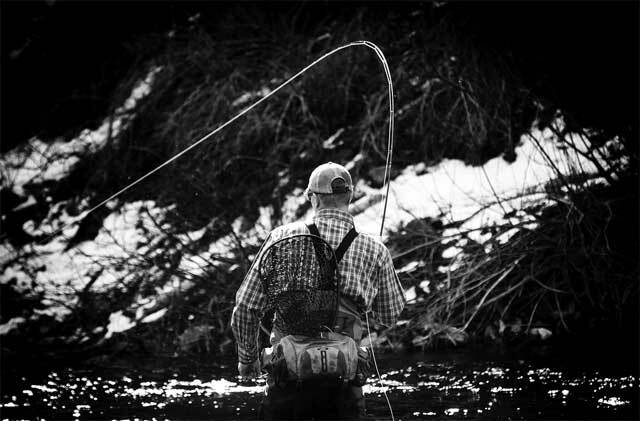 You’re with your buddies, wading up the river, when you see a big brown trout rising. Are you really being that gracious, or are you a little bit nervous about making that cast? If you’re nervous, that’s good. You should be. That means you care. And it doesn’t matter how skilled you are, if you don’t feel a little gurgling in the pit of your stomach at the moment of truth, that means you really aren’t contemplating the task at hand. And you’re not alone in feeling that way. If I told you that Sir Laurence Olivier had stage fright so bad—in the middle of his career—he actually had the people give him a shove onstage, would that make you feel better? The thing is, there’s a fine line between letting the excitement of the moment energize you and letting it consume you and mess things up. A good portion of what makes an athlete great versus merely good revolves around the ability to use nerves as fuel. There are two ways to look at it: from a fishing and a casting perspective. First, let’s get real here and realize we’re matching wits with something that has the brain the size of a pea, or maybe a peach pit. It’s not a life-and-death situation, at least not for you. When you play golf, you miss putts. You move on to the next hole. In fact your ability to shake off the misses is usually what separates a good round from a bad one. The second point is that there really is nothing like practice to smoothe the nerves. When you’ve done something so much that you barely think about it and it just happens naturally, the nerves are less of a factor. So why don’t more of us anglers spend time practicing? Forty feet in four seconds. Casting into the trash can. Whatever works. A musician certainly doesn’t play live without practicing. If I’m practicing a song for a performance, I’ll practice it over and over, until I can play it faster than I really have to. I think that’s true with the cast also. The reason we practice those long hero casts isn’t because we want to be in a place where we actually have to use one. We want to be able to ease back into a comfort zone. And when you’re comfortable (not too comfortable, mind you), you’ll always be first in line to make that cast… unless you’re really polite.